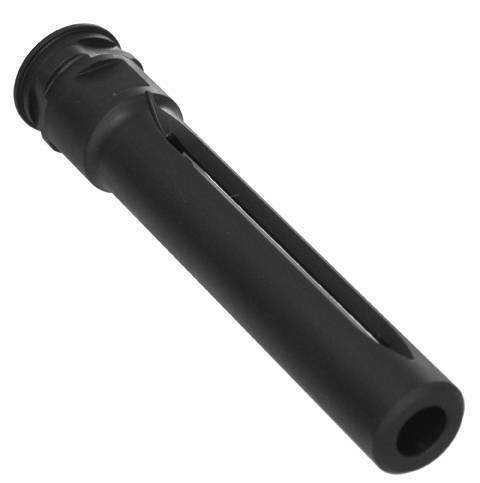 4.75" Long Lug MFI HK G28 DMR Style Muzzle Brake / Barrel Extension for AR15 in 9mm with 16" Barrel or any weapon with 1/2 X 36 thread to get to Ca OAL 30" or MD OAL 29" or a Featureless Ca. Semiautomatic Rifle. WARNING: Use only with 9mm or smaller bullets. WARNING: The Exit Hole necks down to 0.397". Use only with 9mm or smaller bullets. This Version of the MFI HK G28 Muzzle Brake is specifically made for the California and Maryland Markets to meet the California DOJ & MD minimum overall length of 30" or 29" for the AR15 in 9mm and to qualify as a Featureless Ca. Semiautomatic Rifle. Exit Hole I.D. @ 0.397"
NOTE: Even though the overall length of this item is 4.75" part of that is the threads. As you can only count the threaded area once (threads in the product cover the threads on the barrel) so the total ADDED LENGTH to any weapons system's barrel would be about 4.25".